The debt ceiling deal framework released by the Speaker’s office (in powerpoint form) does a great job of spinning a troubling bill. Now to be clear, I am a debt-ceiling raise proponent, and I supported both bills that passed the House. I support the goal of cutting spending in two tranches, and I support automatic cuts that enforce discipline on the political actors to reduce spending commensurate with the debt limit increase. The Medicare cuts that would go into effect if the Joint Committee’s (“JC”) recommended cuts are not enacted are supposed to scare Democrats into accept the JC’s proposal. Not so. The cuts to Medicare don’t reduce benefits — they reduce reimbursements to doctors and hospitals. So rather than require seniors to pay something for their health care and thereby make better decisions, the Medicare cuts would drive more health care providers away from serving Medicare patients, making health care less available for seniors. No cost-reductions there – seniors will still get care, but they’ll have to drive farther and wait longer to get it. That’s rationing by a thousand cuts. So if Republicans fail to accept the JC proposal, they will give Democrats another talking point in their Mediscare campaign (Tea Party radicals, not Obamacare = health care rationing for seniors) without saving a dime in actual health care costs. Despite representing around 20% of the federal budget, defense will comprise 50 cents of every dollar in the “trigger” cuts that occur if the JC’s recommendations are not passed by Congress. If ever there was a sign that the Democratic Party has abandoned national security as a political issue, this is it. Prominent figures across the center-right, from Allen West to John Bolton to Joe Lieberman, have sounded the alarm against these cuts, which would not come with any fundamental restructuring of our vision of defense policy. We’d still be in Iraq (and losing ground). We’d still be in Afghanistan (but leaving too soon). We’d still be in Libya (for some unknown reason). And we’d still be defending Europe from a superpower that we helped vanquish two decades ago. But we’d be doing all of these tasks, which no other military in the world could handle simultaneously, with less armor, less ammunition, fewer soldiers, and less high-tech weaponry. Think we’ve got a peace dividend to cash? Consider the following graph. And then consider that Democrats have a once-in-a-decade opportunity to strike a $750 billion hole in defense and blame it on the Tea Party, merely by refusing to make further cuts in spending. Is there anything easier for a Democrat than refusing to cut the national budget? Why in the world, then, would Democrats ever be serious in trying to achieve a consensus for spending cuts in November? The alternative to military and Medicare cuts are domestic programs, precisely the things they refused to cut all summer in the face of debt default. The automatic cuts are great for them politically, and the Medicare cuts can be undone once Democrats regain control over the budgetary process (to cheers from the Left and seniors, who will come back “home” to the Democrats). The defense cuts, however, will be permanent — they will enrage the Right, starve our military of resources, and all but demand a pullback from “overseas contingency operations” that Obama can now say he is forced to end due to budgetary concerns. This deal is a blueprint for Democratic political revival over the next 15 months. Do not throw the Democrats into that briar patch, Republicans. 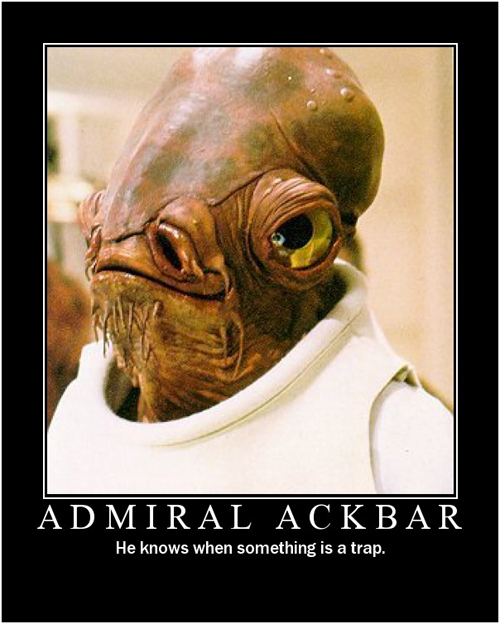 Admiral Ackbar knows best. …but it’s even nicer to have a federal judge agree that you’re right. On to the Supreme Court. Or just repeal the darn thing and get it over with. P.S. – for all my lawyer-geek readers, here’s the full opinion. (h/t National Review). One thing we’ve learned in the past several cycles is that Democrats truly believe they can only lose elections when they are stolen from them. Democrats should rightly win all elections. Republicans only win when secret money is deployed from overseas, dimwitted citizens are scared out of their minds, and nefarious special interests get stealth candidates to attack real public servants. Of course, such efforts don’t always turn out as intended. A group called the Illinois Democratic Coordinated Campaign sought to solicit hundreds of thousands of Democrats to use Chicago’s new “vote by mail” system, but glitches with the paperwork appear to have thrown a hitch into the scheme. Unless voting officials can sort it all out in a week, the affected voters could either lose their opportunity vote or at least be so confused by it all that they don’t bother. Call it a little karma coming back around Alexi Giannoulias’ way — his bank failed its customers, and now his turnout machine is failing him. So don’t believe everything you hear. But don’t tell me it doesn’t happen. I’ve watched union thugs take down signs five times in two hours on a road outside a precinct. I’ve responded to a complaint by a voter who said she could only be given Democrat ballots in her union hall precinct (and this was the 2004 general election), only to be told with a smirk that the voter (a 48-year old doctor) must have misunderstood. Be vigilant out there, folks. We’re too close to allow shenanigans to get in the way. As discussed in a Wall Street Journal opinion piece today, there’s emerging evidence that Democrats intend to move all of their most controversial legislation — and their hearts’ deepest desires — to a lame duck session after the November elections. That way, their members don’t have to take tough votes in advance of their elections in the fall, but Democrats still get to take advantage of their once-in-a-generation situation of huge majorities in Congress with a friendly president. Card check, cap-and-trade, higher taxes on corporations and the wealthy — it’s all in the lame-duck agenda. There is nothing illegal, unconstitutional, or improper about this. It is, however, anti-democratic, cynical, and entirely preventable. In response, the 41 Republican members of the U.S. Senate should issue a joint statement, signed by everyone, making it clear that while they will attend and participate in any session of the Senate that is called, they will all vote against cloture on every piece of legislation brought to the floor during a lame-duck session (at least assuming there is no imminent threat to the nation or somesuch thing). It would almost be overlooked as a vapid statement by a 70-something Senator who didn’t sleep the night before, but Pelosi’s statement has been mocked so thoroughly — it appears in seemingly every story about the health care bill containing nasty surprises — no politician worth his salt could repeat such words without instantly realizing his error. Of course, the guy is retiring, after all. No wonder Democrats are hitting historic lows in the generic ballot. As Barone says, it’s a lethal mixture of pervasive incompetence and unpopular ideology. UPDATE: Rob Long pointed out this gem from the same press conference. about the same bill. Oh, good. So we don’t have to worry at all.